The 1st Snow...on a White Wednesday! I begin my watch for the First Snow of Winter. so that I can't see grass. Okay...so almost cover all the grass will work too! I was up just before 7...and couldn't wait! So here is our Potager...as it will remain for the Winter. And my raised herb beds. What is it about Snow that makes me smile? The Snow makes everything better...It even has a way of making me feel better. 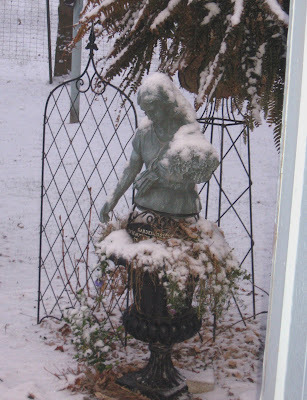 My little garden lady...Her flowers were still blooming in her urn...last week! Today...we have icy rain...and wind! And the 1st Snow....to keep me going. I hope you all have a Wonderful White Wednesday! Please Visit Kathleen at Faded Charm for more Wonderments in White! Thank you Kathleen for Hosting this event ...I look forward to it each week! This one turned out really well...It has lots of little extra's and is even Black and Cream toile on the back! PS The pillow is absolutely yummy! Donna the pillow is gorgeous!!! You do create the most wonderful things. Isn't the snow just magic?! Your place looks lovely dressed in the first snow of the season. I love your urn and your beautiful garden lady. It's good thing that you live so far away or I would be nagging you for that little tresure. I can't seem to get enough urns and statues to place around. I would love to send you the biggest hug I can muster up today dearest Donna to help take the blues from you. Beautiful white photos today. I love how the snow looks covering the outside structures and statues. Thanks for sharing then with us. Beautiful... 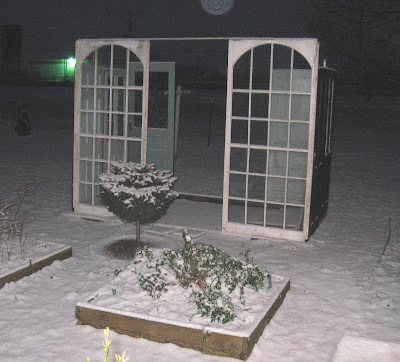 I wish it snowed where I live for Ca it is a bit chilly right now so I am happy :)... I hope your week is going well so far. Thanks for stopping by my blog! It is always nice to meet new friends! I adore your Potager!! I also love your lady statue. She is gorgeous. Indiana huh?? My son lives in Huntington . Is that close to you?? That snow is just beautiful! Having never lived in a snowy area, I don't think I would last too long in the cold, but it sure looks like winter and does make everything look so pretty! Hi Donna, everything looks so beautiful with a dusting of snow. We've had flakes, but nothing more than a trace, but good grief it's been soooo cold, makes me just want to stay in with a cuppa hot cocoa. Loved seeing your garden. Your little lady is so elegant. Hope your OK, and that your blues are fleeting. Yeah the winter wonderland is gorgeous too! Thanks for stopping by my blog and leaving such a sweet comment! Now I have to go check out more of your blog! 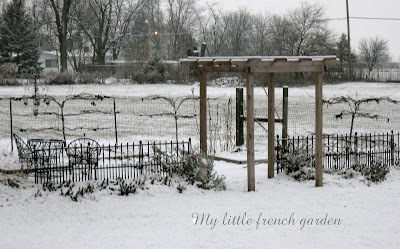 What an elegant garden, all clothed in white! It reminds me a bit of a garden from a Jane Austen tale, I can almost see Miss Bennett and Darcy taking a turn around the perimeter. You KNOW that I'll be thinking about ya today, right? Big hugs from slightly warmer Texas today! 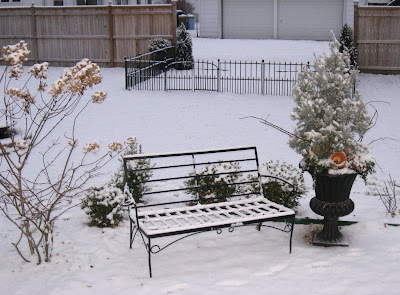 Donna your garden looks just beautiful with a pretty blanket of snow on it!!! I received my stocking yesterday and I LOOOOOOVE it!!! Thank you so much for the extra goodies too and the beautiful packaging...it was so much fun to open!! Blessings to you my talented friend!